Is this a good time for you to step back, check in, and ‘draw out’ your vision for the coming year? What would you stand to gain? What would your relationships, and your work stand to gain? What would you like to bring forward and create? Are you ready to really CLARIFY, DECIDE, & COMMIT? 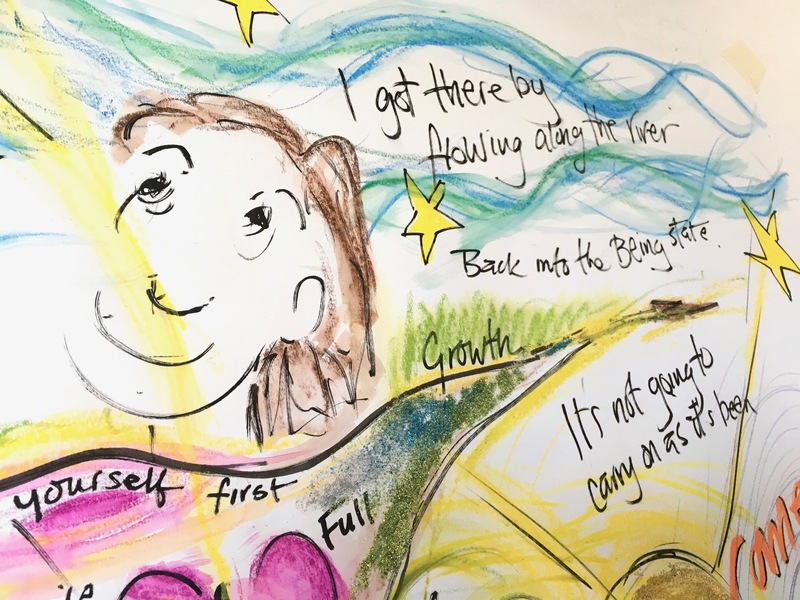 A service and a product: a one-off individual creative leadership session with your own visual map drawn from the session. How long and is the session? 225.00€ excl. tax + 25.00€ postage and materials – 1.5-hour session + full-colour hand-drawn picture. 2017 was a year of great shifts for so many of us. I saw it in my own life and in the lives of those close to me and the with clients. These shifts all began on the inside, they were all been initiated with a decision and a commitment to transform once and for all. The Vision Quest Session will bring clarity to the steps you need to take right now. Many women I know in particular are really beginning to step forward and commit most powerfully to the work they are here to do and the gifts they bring the world. Collectively, we seem to be stepping into a different way of looking at our lives and the things showing up each day. We seem to be rising above the level of action and reaction and looking for a ‘third way’ through which also offers us the breakthrough we need. The time for thinking about it is over; it’s now time to get out and share our gifts and BE that person in the world. This makes me very excited about how this is going to play out in 2018 for us all! And of course, it’s that time of year again where I offer my Vision Quest Session for the coming year. It’s a chance for you to clarify, decide and commit to deep transformation and profoundly new results. If you would like to know more or enrol in this service, click here.